I can’t blame unfamiliarity with these dishes, because I’d made them all before; most were even from Tom’s and my own recipes. Mercifully, Vicky and John, our guests for that evening, are good sports as well as adventurous eaters, so they were unperturbed by the appearance of their plates. The first setback was the antipasto, my mozzarella in carozza. 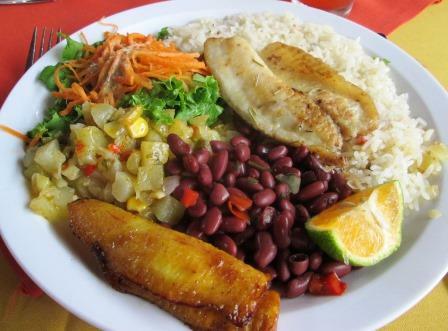 This should have been a good-looking dish, as well as a delicious one. 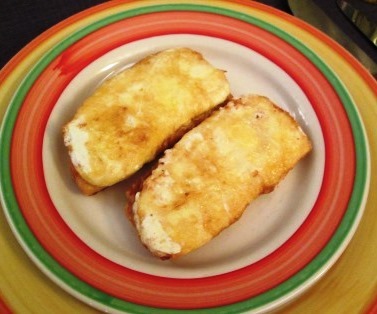 It’s made with slices of bread and slices of mozzarella, floured, egged, pressed together, and fried in olive oil. I’ve made this successfully for years (even wrote about it here once), but this time the egged bread tried to fall apart, and the mozzarella broke through its supposed-to-be-golden crust. Though it didn’t look at all appetizing, it still tasted much as it ought, and we all ate it happily enough, along with a little sauce of anchovy, butter, and cream. 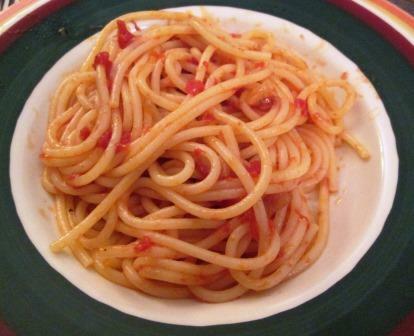 The spaghetti all’amatriciana also was from one of my recipes, this one in La Tavola Italiana. The only thing wrong with the pasta this evening was that the classic recipe uses bucatini, not spaghetti, and I only discovered that I didn’t have enough bucatini for four when it was too late to run out and buy more. Though very plain-looking, the dish tasted especially good because the tomato sauce was enriched by a particularly flavorful artisan variety of guanciale (air-cured pork jowl) that we’d smuggled in (shh!) from our last trip to Rome. 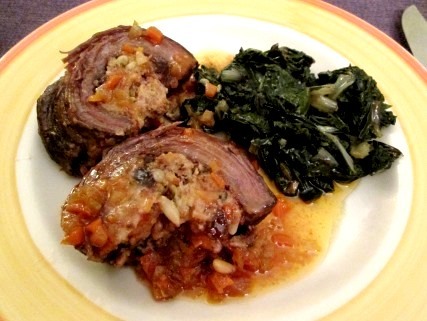 But then came the stuffed flank steak: braciolone alla napoletana, yet another recipe from La Tavola Italiana. To get the full effect of this near-disaster requires several illustrations. 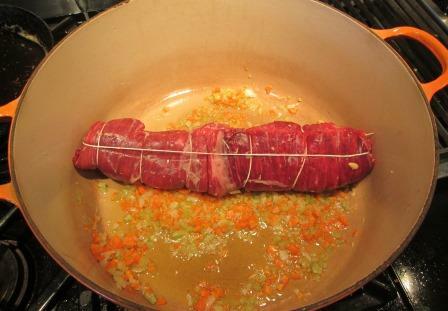 Now, here was the first problem: Which way should I roll that meat? Starting at the short side would have made a great blimp of a cylinder, with many opportunities for the filling to leak out during the cooking. So I rolled from the long side, making a long skinny tube. I’d placed the roll in the pot seam-side down, hoping it would seal. Nope! 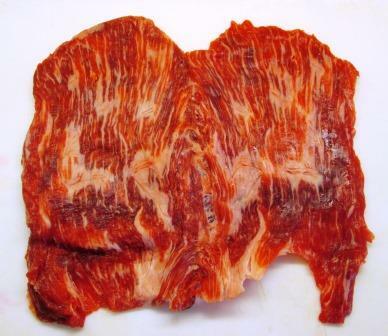 What it did was spread open as far as it could around the strings, as the meat shrank during the cooking. With the stuffing exposed that way, I didn’t dare turn the roll at all for the hour of slow, gentle cooking it would need. So I poured in white wine and diluted tomato paste, covered the pot, and looked in every 15 minutes to baste the meat with the juices and be sure it wasn’t sticking to the pot. When fully cooked, the roll was definitely brutti. Maneuvering the meat out of that deep pot onto a cutting board without its breaking apart was a little tricky but we did it. And despite my fears, when I cut off the strings it stayed intact. 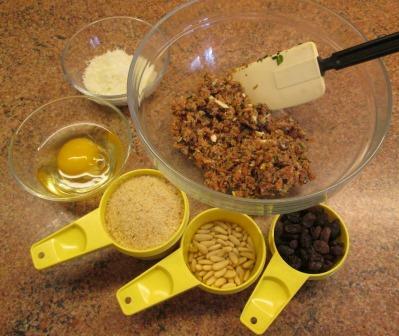 In fact, it divided into not-bad-looking thick chunks for serving. 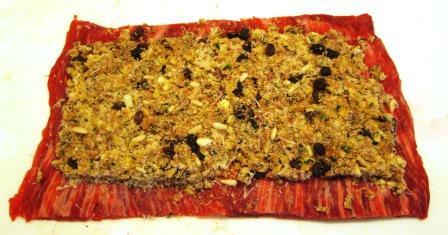 And if I do say so myself, the beef and its stuffing were both delicious: genuinely buoni. 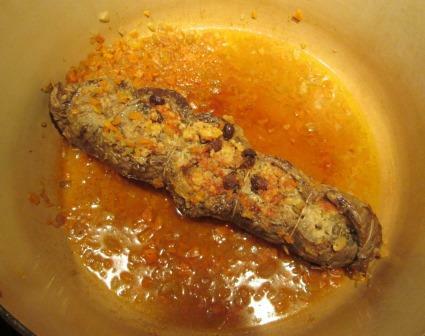 In retrospect, I can see it was a mistake to spread the stuffing all over the butterflied steak. In previous (forgotten, evidently) cases, I must have mounded the stuffing in the center and closed the meat over it, with enough overlap to ensure the stuffing stayed covered. I’d better annotate my recipe to that effect, to avoid imperiling future dinners. The cheese tray, requiring no cooking or manipulation, was safely beyond my ability to harm it, but my dessert, the fig and almond tart, was one more barely averted disaster. I’ll save the rest of that story for my next post. I don’t know what put egg foo yung into my mind. I hadn’t given the dish a thought since, as a child, I began discovering “exotic” substances like chop suey at a suburban Chinese restaurant with my family. Chinese food in America has come a long way from the ubiquitous Cantonese-and-MSG style of those days, but many of the old-time flavors are still pleasant. So, on a day when I was idly thinking about French omelets, Spanish tortillas, and Italian fritattas, egg foo yung popped into my mind. 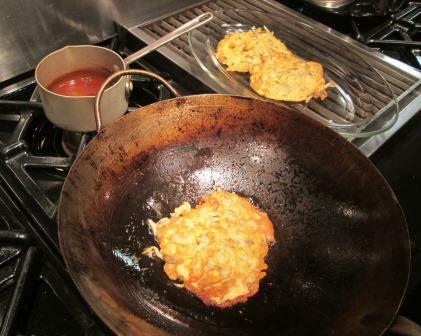 Why not try my hand at those Chinese egg pancakes in a brown sauce? 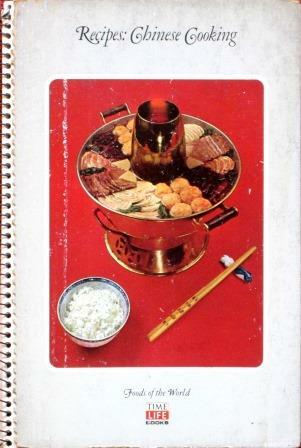 Three of my four Chinese cookbooks had recipes for the dish – some quite elaborate. Remembering the modesty of that long-ago restaurant, I decided to make the simplest version, which was in the Chinese Cooking volume of the Time-Life Foods of the World series. From my experience with the pace of cooking Chinese recipes, I knew I’d have to assemble and measure out all the ingredients before starting. These weren’t very many for half a recipe’s worth: eggs, chicken stock, mushrooms, shrimp, bean sprouts, soy sauce, salt, and cornstarch. My shrimp had to be peeled, cut in small pieces, and stir-fried in a lightly oiled wok for just one minute by themselves. Before doing anything more, I made up the sauce, starting by dissolving the cornstarch in a bit of the cold chicken stock and mixing the salt and soy into it. Then I was to bring the rest of the stock to a boil, add the cornstarch mixture, and simmer for two minutes until the sauce was thick and clear. 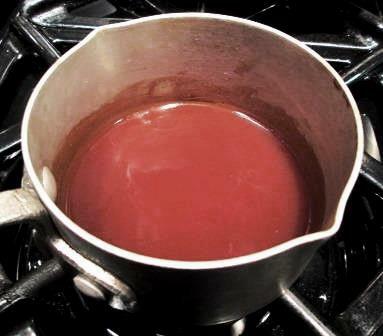 It thickened quickly enough, but the soy coloring kept it from being what I’d call clear. But it was translucent, though it doesn’t look that way in the picture, so I assume that’s what was meant. I kept the sauce warm at the back of the stove while I assembled the pancake mixture. 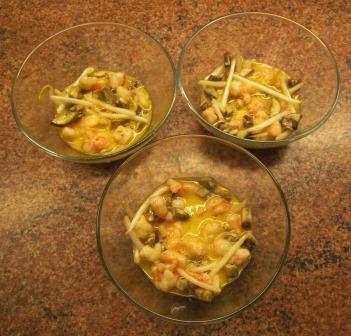 Shrimp, mushrooms, and bean sprouts all went into the bowl of beaten eggs. Since the half recipe was to make three pancakes, I took the prudent approach of dividing the mixture evenly in three little bowls rather than trying to estimate quantities on the fly. 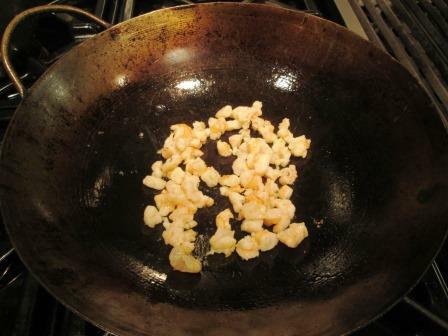 The frying went fast and well in the very hot wok, each pancake taking only about a minute on each side. Then plating and saucing, and the recipe was done. I can’t say I had a Proustian recollection of my childhood when I smelled the dish, but the aroma was pleasing. The pancakes and their sauce were very good in a mild, homely, old-fashioned way. That sauce was absolutely essential. 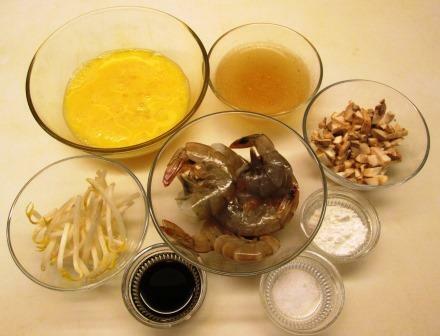 When I took a bite of the pancake alone, it was bland almost to tastelessness, but the smooth, thick, salty sauce immediately brought up the flavors, as well as the nice textural variety of the crunchy bean sprouts, tender egg custard, and nubbly bits of shrimp and mushroom. 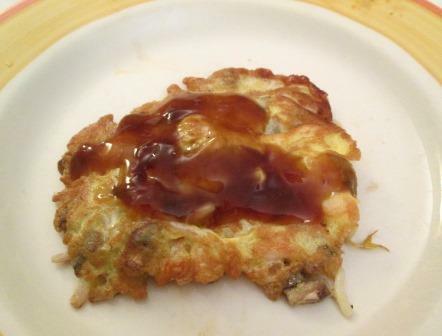 So, egg foo yung: a pleasant little walk down Memory Lane. It’s being a good year for many local summer vegetables: tomatoes, corn, peppers, and onions. The small early-season onions at my greenmarket were especially mild, moist, and sweet. As they grew bigger, they lost some of that fresh youthful charm, and by now the onions being sold are mostly “cured,” having the paper-thin dry skins of year-round store onions. But one greenmarket stand is still offering nearly fresh small ones. My original intention for the box I bought this week was to make a batch of the Italian sweet-and-sour preparation cipolline in agrodolce. 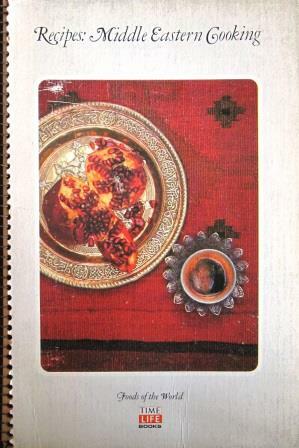 But as I browsed recipes ranging from very simple to quite elaborate, none caught my fancy. So I turned from my Italian cookbooks to my Spanish ones. 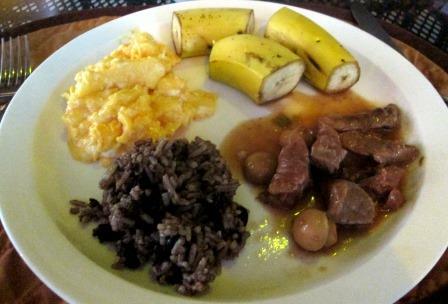 In Penelope Casas’ Tapas I found a recipe called cebollas in adobo, which instantly appealed. Its slightly sweet marinade was unlike any adobo I’d seen before and looked to be very tasty. Tiny onions are often the devil to peel, but the ones I took to make up the recipe’s ½ pound behaved like angels. A brief dip in boiling water, removal of the root and stem tips, and the delicate skins slid right off, smoothly and evenly. To start the cooked marinade I needed small amounts of chopped tomato, onion, garlic, and parsley, plus a bay leaf, some basil, and dried thyme. After a brief sauté of the onion, garlic, and tomato, I added the herbs, salt, pepper, and a little water, covered the pan, and simmered for 20 minutes. Then I put the onions in a small saucepan with the tomato mixture, 1½ tablespoons of olive oil, ¼ cup of my own red wine vinegar, 2 tablespoons of raisins, 1 tablespoon of sugar, a little more thyme, basil, salt, and pepper, and another ½ cup of water. All this was to simmer, uncovered, for 45 minutes. By then, my kitchen was scented with the zesty marinade reduction, but my onions still weren’t quite fully tender. They took another 15 minutes of gentle tending, along with a tad more water to keep the sauce from scorching. They looked very tempting, just as they were, but the recipe said to cool and refrigerate them, so I didn’t even sneak a taste. Besides, the recipe also said they’d go well with any other sauceless tapa, so I needed time to prepare a companion for them. From a recipe in the same Casas book I made a tortilla of potato, chorizo, ham, and peas. This was also to be served at room temperature, so it was evening when we finally sat to the two tapas. 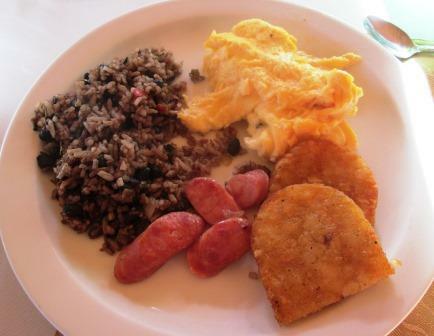 It was a good combination, as well balanced as were the flavors of the onion dish itself. That was neither strikingly sweet nor strongly sour, but a pleasing blend of flavors, the lightly enhanced sweetness of the onions counterpointed by the acidity of vinegar and tomato. The tortilla was also very tasty, with its own counterpoint of smoky ham and chorizo poised against the sweet young peas and egg, and with a texture just firm enough to welcome a little moistening with the onions’ excellent adobo. Both tapas went very well with a bottle of 2011 Consejo de la Alta Rioja, highlighting the affinity a region’s dishes always show for the kind of wines they grew up with. Eggs à la tripe popped into my mind the other day. Why, I don’t know – I hadn’t made them in more than 20 years. Nor do I know why I hadn’t: We’d definitely liked them on the few occasions I did. Somehow they just disappeared from my repertoire. If you’re not familiar with the dish, don’t be put off by the name: There’s no actual tripe in it. As I recalled it, oeufs à la tripe was a very simple French preparation: just hard-boiled eggs and softly sauteed onions in a sauce of béchamel with gruyère. But, for the details, I had to figure out which of my cookbooks I’d found the recipe in. Larousse Gastronomique, La Bonne Cuisine de Madame Saint Ange, Raymond Oliver’s La Cuisine, Anne Willan’s French Regional Cooking, and the Time-Life Good Cook egg volume were all ruled out because they don’t use gruyère in their oeufs. The Dione Lucas Book of French Cooking does call for cheese, but it’s a much more complex dish than the one I remembered. Clearly, the dish I remembered isn’t the primary or classic version. But it’s the one I wanted to have. On a hunch I checked Craig Claiborne’s New York Times Cookbook, and there I recognized my simple recipe. My research method may be haphazard, but its results are sound. So merrily into the kitchen I went and set to work. My faithful knife man sliced half a very large Spanish onion for me, which I softened slowly in butter, covering the pan partway through so the onions wouldn’t brown and stiffen. 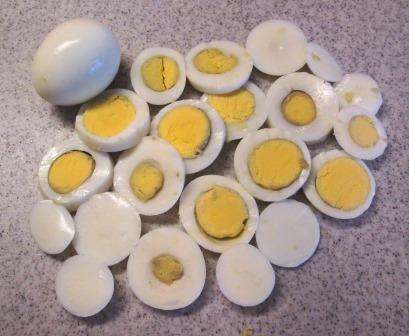 While the onions cooked I sliced four jumbo eggs that I’d hard-boiled the previous day. 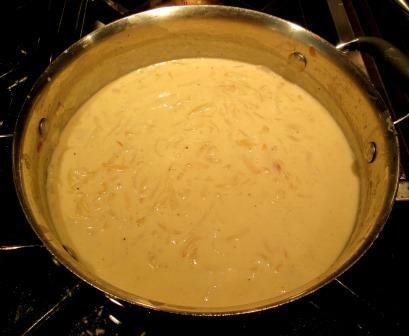 Back at the cooking onions, I sprinkled on salt, pepper, and 2 tablespoons of flour; stirred the flour in well; and gradually stirred in 1⅓ cups of milk – thus making the béchamel right on top of the onions. 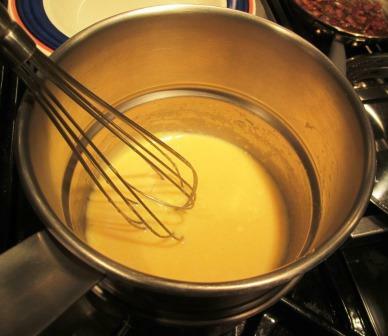 When the sauce thickened, I stirred in ⅓ cup of shredded gruyère and let that melt in. Finally I gently folded the sliced eggs into the sauce, trying hard to keep them from falling apart. Snatched tastes of that sauce, by the way, were even better than Tom or I had remembered. Might have been given an extra boost by the excellent cave-aged gruyère I had on hand that day. 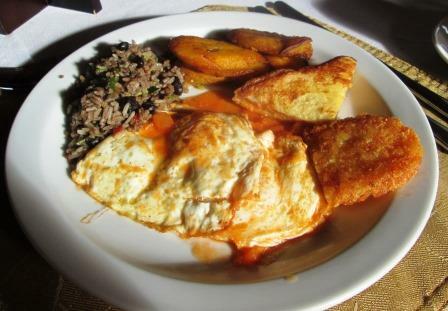 At that point the eggs are ready to eat just as they are, over toast or rice, the recipe says. But it has an alternative serving suggestion: spread the mixture in a gratin dish, dot with a little more butter, and run it under the broiler to brown lightly. 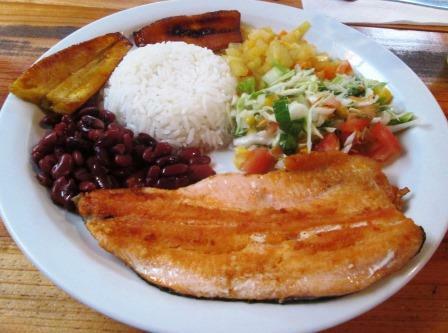 I liked that, because it could all be prepared well in advance and just finished at dinner time. 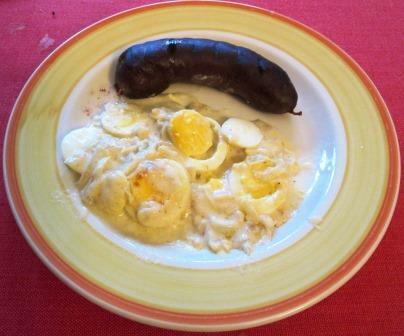 That evening we had the eggs and their lovely sauce alongside grilled boudin noir sausages. They made a nice sloppy summer supper, and an excellent match to a lightly chilled red Burgundy. It’s always interesting to look at a recipe for a very different version of a very familiar dish. Will it be as good as the way I make it? Will it be better? 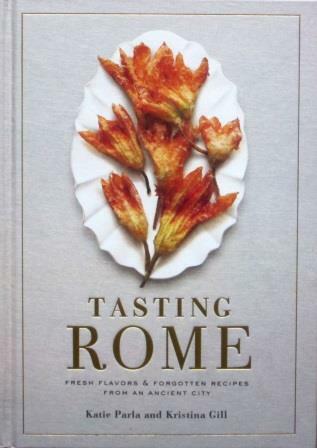 My newest cookbook acquisition, Tasting Rome, by Katie Parla and Kristina Gill, offers several opportunities for those comparisons, since I love Roman cuisine. 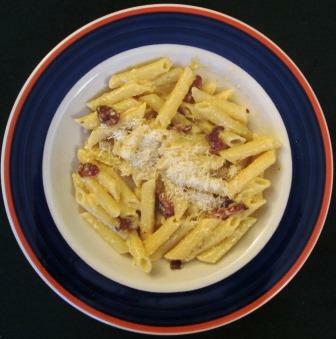 The first recipe I ventured on was pasta alla carbonara, a dish especially dear to Romans and a staple at my house. As the authors – young American food journalists who live in Rome – say, this is a dish whose exact ingredients and technique give rise to passionate argument among Roman cooks (among whom I like to think myself an honorary member). My own recipe, published in Tom’s and my 1988 cookbook La Tavola Italiana, is of course the version I like best, so I looked at theirs with a critical eye. They offer two versions, both with differences from mine, most notably one that makes the sauce in a double boiler. I’d never heard of that, so it’s the one I decided to try. 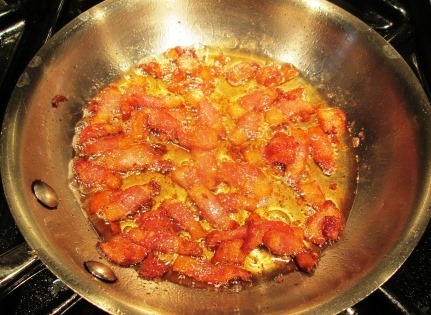 The book’s recipe begins by having you sauté small strips of guanciale in olive oil, drain it and let it cool. According to Tasting Rome’s recipe, while the pasta is cooking, you beat together eggs, grated pecorino Romano, black pepper, and water in the top of a double boiler over simmering water, whisking continually until the cheese melts and the mixture thickens. My recipe calls for simply beating the eggs in a bowl with pecorino and parmigiano, salt, pepper, and parsley. Back to Parla and Gill: Off heat, you stir the guanciale and the cooked pasta into the sauce in the double boiler; transfer it to individual bowls, and sprinkle each portion with more grated pecorino and black pepper. That last step was also a very significant difference. In my version, I add slightly underdone pasta to the warm pancetta-onion mixture in its sauté pan, toss over low heat to coat the pasta with butter and oil and finish its cooking; then, off heat, stir in the egg-cheese mixture and serve. That procedure creates a sauce with a very different mouth feel, and one I like a lot better. For me, the double-boiler sauce was too glutinous, and since I couldn’t coat the pasta first with the mixed fats, it absorbed too much of the sauce and came out tasting flat and floury. And despite how smooth the sauce had seemed in the pan, on the pasta it was somewhat grainy – not pleasant to the tongue. Oh, well – de gustibus. Tom and I are back from the birding trip to Costa Rica that I mentioned in my last post. 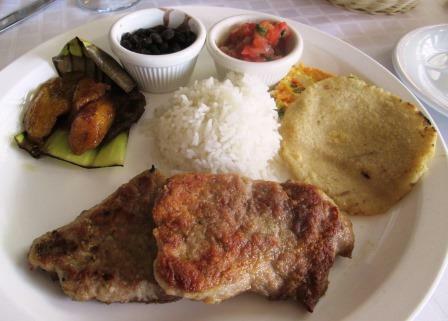 Our very modest expectations for its gastronomical aspects were right on target: The food was fresh and flavorful, but there was a very narrow range of both ingredients and preparations. So, all in all, the food on our trip was sustaining rather than exciting. But exciting the birding definitely was. In one week we saw nearly 200 species, including quetzals, trogons, motmots, toucans, parrots, aracaris, oropendolas, cotingas, manakins, honeycreepers, flower-piercers, and 23 different kinds of hummingbirds. 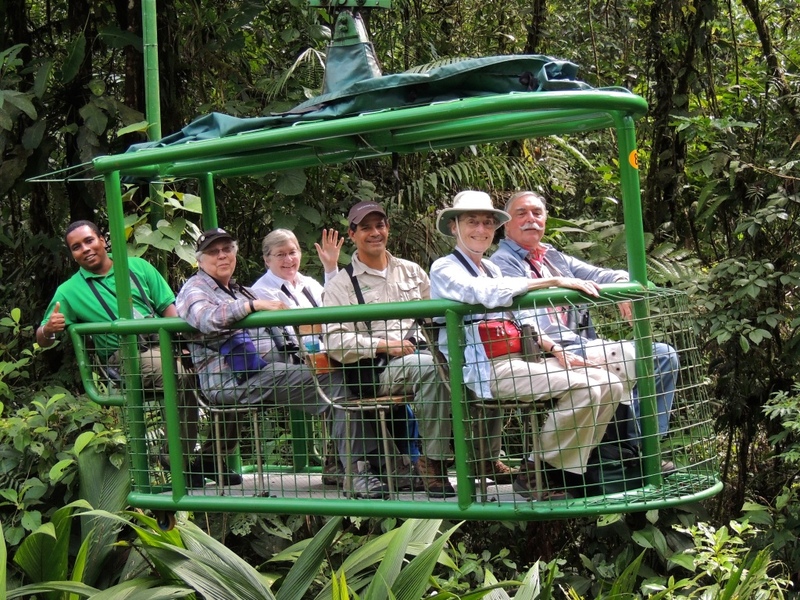 Here we are at the end of an aerial tram ride through the rain forest. Quite a change from our usual urban life! 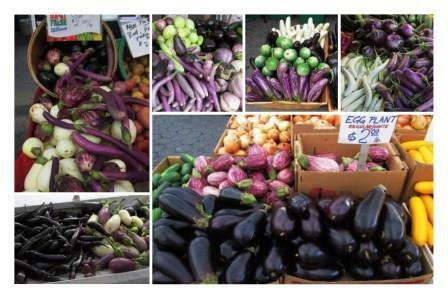 Eggplants are everywhere in my Greenmarket now. Not just every where, but every size, every shape, and every shade in the white, green, and purple ranges. They’re among my favorite summer vegetables, and I make them most often in composed Mediterranean-style dishes – ratatouille, caponata, ciambotta, parmigiana – sometimes stuffed, and occasionally just simply baked or fried. Most recently I wanted to try a different kind of preparation, so off to the cookbooks I went on a search. 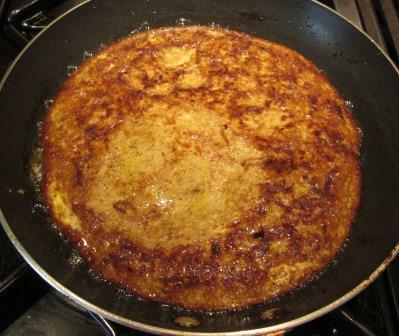 In the Middle Eastern Cooking volume of the Time-Life Foods of the World series, I was intrigued by several Iranian recipes for coucou, explained as a thick vegetable pancake. One, Coucou Bademjan, was for eggplant. That would do! I initially thought the dish would be like a frittata. 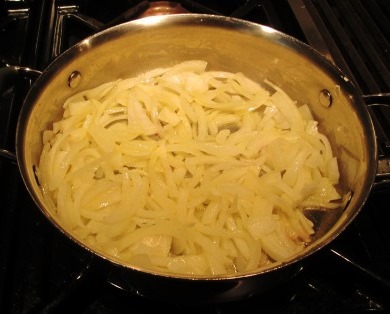 You start by frying thinly sliced onions in olive oil until dark brown. (This is a common way of treating onions from the Middle East through India, and the effect is quite different from less-cooked western ways with onions.) Take the onions out of the pan, put in half a pound of eggplant cubes, and stir to coat them with the oil. Add turmeric (whose color you’ll spend the next three days trying to remove from pans and implements), salt, pepper, and water; bring to a boil, reduce to a simmer, cover and cook until the eggplant is tender. 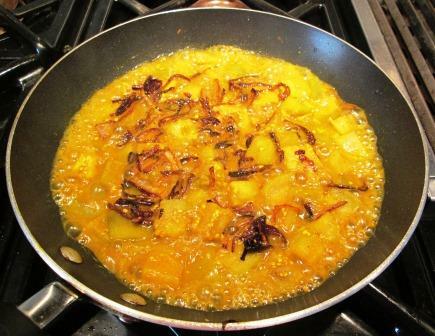 Return the onions and cook briskly, stirring, until the liquid is almost all evaporated. Then you transfer everything to a large bowl and let it cool. Finally, eggs are beaten in: four of them. They made a very soft batter, unlike any frittata mixture. The cooking technique is different too. It’s done in that same pan, with more olive oil, of course – eggplant is a sponge for oil! – but covered. Mine cooked quickly around the edges, while the center stayed very wet. 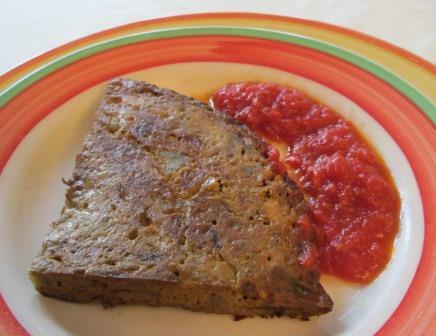 The eggplant itself seemed to be liquefying rather than firming as the batter cooked. The recipe’s next instruction was strange. You’re to cut the cake into four wedges right there in the pan, keep on cooking for a minute or two “until the center is firm,” invert a plate over the pan, flip everything over, and slide the coucou back into the pan to cook the other side. At that point Beloved Spouse, who is the frittata cooker in our household, intervened. Ridiculous to cut wedges and then try to turn them over as a single cake! Also, when the uncooked side touches the plate, it’s likely to cling, making it hard to get the item to slide cleanly back into the pan. He finished the cooking according to his own technique. When he judged the coucou to be ready to turn, after quite a bit more cooking time than indicated, he slid it out (uncut) onto a large, upside-down pan lid, which he held from below by the knob; inverted the pan over it, and then quickly flipped the whole thing; cooking the second side again longer than the recipe said. It came out an attractive golden brown, but still much softer than a frittata ever is. When the coucou was on its serving plate, I finally cut it into quarters and served them, as the recipe suggested, with a few slices of ripe tomato. 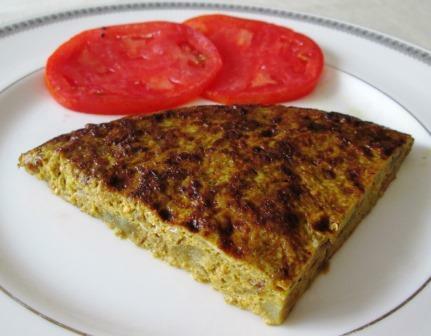 As you’ll see, it does look a bit like a frittata, but it was nothing like one in texture. Didn’t look much like a pancake either, for that matter: It was still soft and very moist. Quite tasty, though, and pleasantly eggplanty. We ate the first two quarters at a lunch – it’s pretty rich and filling – and I put the rest in the refrigerator for another meal. Two days later, for a dinner, I warmed the leftover two quarters in the toaster oven and served them as a first course with a simple (also leftover) tomato sauce on the side. They’d dried and firmed up a bit, and tasted even better than previously. This was a very different way of treating eggplant than any I’m familiar with, and I’m not entirely sure the dish turned out the way it should have. But it was interesting to try, enjoyable to taste, and a learning experience that has me considering other uses for the coucou approach. This is Tom -- husband, kitchen companion, and co-author of my two cookbooks. Tom is also an award-winning wine writer. Click on the photo to visit his blog, "Tom's Wine Line." Our second cookbook now in digital version. Click on the image.